Home : Prairie Blog : All News : Hawks Soar at State! WIAA Division 4 State Champions! A well deserved congratulations to the Prairie Hawks Boys Soccer Team on their thrilling season. 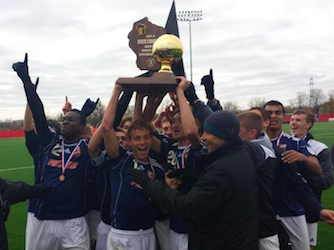 The Hawks completed their season with an impressive 2-0 victory over Saint Thomas More High School in the WIAA Division 4 State Championship. Bobby Gaertig was named defensive soccer player of the year in the Metro Classic Conference last season. But this season, the Prairie School senior was told he needed to become more offensive minded. No problem. Be sure to follow us on Twitter (@PrairiesSchool) for up-to-date scores and recaps on Hawks athletics throughout the year. This entry was posted in All News, All School, Athletics, Featured, Upper School by Communications Department. Bookmark the permalink.